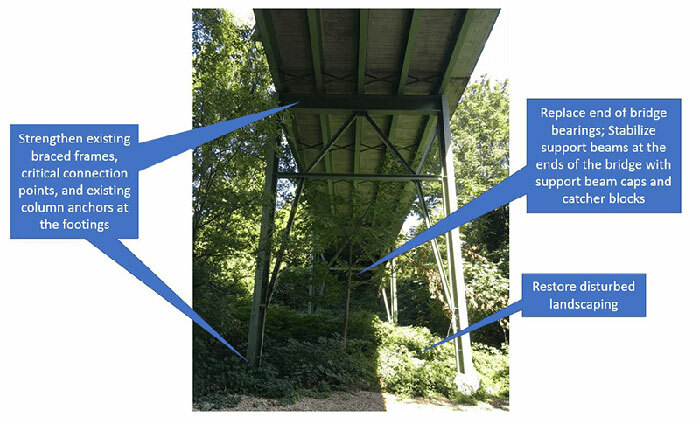 The Magnolia Community Council will hear an update on SDOT’s plans to seismically retrofit the West Howe Street Bridge during its April 16 meeting. West Howe is one of 16 bridges selected for seismic retrofits as part of the Levy to Move Seattle, and was constructed in 1981, prior to seismic design code modernization. It crosses 32nd Avenue West and ends at Magnolia Boulevard West, providing connections to the southwest edge of Magnolia. SDOT has evaluated the bridge and identified structural elements in need of seismic upgrades, and plans to start construction in June and finish by early 2020. Work will include replacing bridge bearings and stabilizing support beams at the ends of the bridge, strengthening braced frames and existing column anchors at the footings, and landscaping restoration. The bridge was slated for repainting in 2022, but that work will now coincide with the seismic retrofit. The project is estimated to cost $4.2 million. Learn more during MCC’s next meeting 7 p.m. Tuesday, April 16, at the Magnolia United Church of Christ, 3555 W. McGraw St.